You are here: Home / Media Reviews / ABC Monsters: Starring QRSTU – Impressive and colorful animation and learning style. Fun way to teach the alphabet to early learners. Twenty six cuddly ABC Monsters live within the walls of Capital Castle. 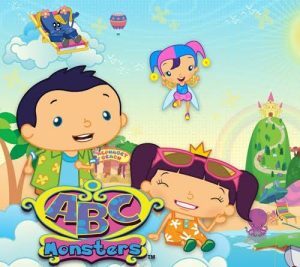 Each monster represents a letter of the alphabet. Should any of the monsters go missing for longer than a day, all the letters will be wiped clean from every book in Capital Town! In this DVD, embark on adventures with Alice, Brian and Cherry Berry to search high and low for the letters Q, R, S, T and U. It’s a rainy day at Capital Castle. The big Capital Castle raffle is supposed to happen today but it has been canceled! The raffle is to be held in Alphabet Garden but with all this rain there is no way the raffle can happen. Get set for a spellbinding series of magical adventures that engages preschool children’s imaginations, while making learning exciting and entertaining. KIDS FIRST! Film Critic Morgan B comments, “I definitely want to recommend this colorful, quirky show that teaches your kids about letters and words. It will definitely have them singing and laughing while they learn.” Ella L. adds, “ABC Monsters: Starring QRSTU is very impressive with its colorful animation and learning style. I really like the nature backgrounds when the characters are outside.” Jennifer V. sums it up with, “I really enjoyed this DVD along with the 4 young children who watched with me… My kids danced, acted out the letter shapes, and sang for the rest of the night. This DVD will definitely be watched again as the sing-along and word puzzle sections are awesome.” See their full reviews below. I definitely encourage you to share this with your preschoolers because it teaches things that most kids don’t want to learn, but makes it fun and energetic so they will want to watch this DVD over and over again. My favorites episode is Rain and Raffles. I love that one because there is the adorable R-Monster, who is my favorite monster or alphabet letter. One of my favorites I should say, because there are many. Other than that episode, I really like the way that they have so many fun and new characters such as the adorable rabbit who has a magnificent garden full of radishes, carrots, tomatoes, lettuce, any kind of vegetable you can think of. They’ve probably got it. There is even a gigantic radish that you’ll learn more about when you watch the DVD. I love this DVD because it’s fun and exciting and I love how it teaches so many different letters and so many different words. I mean, they have one amazing episode about the letter R. That’s what I call terrific. All these letters are just magnificent because they all are so different from each other. None of them are the same color and they all have their own perspective and personality which I love. This DVD targets preschoolers who are learning how to spell and they deliver a great production. This is a wonderful show for teaching young learners alphabet letters and simple words. The producers have been careful to make sure that the spelling and reading comprehension skills are tattooed into the audience’s brains by including songs and cute little riddles. I’m impressed with what the team at ABC Monsters has created. This DVD is perfect for preschoolers or young ones learning the alphabet (ages 2-5). There is lots of interaction, helpful characters and a fun sing-along that will entertain your kids and have them dancing. The bright colors and calling out answers to the word puzzles make it even more exciting. My favorite part is the assortment of songs which really help kids to remember the letters they just learned, even after the episodes has ended. My kids danced, acted out the letter shapes, and sang for the rest of the night. This DVD will definitely be watched again as the sing-along and word puzzle sections are awesome. I give it 5 out of 5 stars.